Using stop motion animation and clever editing, this short features Wannberg reading No Mercy, a poem that breaks the boundaries and sets the bar for contemporary poets worldwide. Scott without a doubt, bears the mark of a true poet; honest yet tangible emotion. 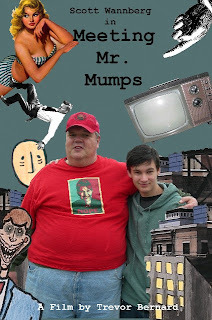 In an entertaining and creative short film; Meeting Mr. Mumps, produced by Susanne Swanson-Bernard and created by Trevor Bernard; a young poet and emerging filmmaker. Trevor, inspired by Scott Wannberg, a mentor and friend shows his dedication to poetry and film throughout this short film. Trevor clearly has a keen eye for cinematography, animation and the short includes Trevor asking Scott a series of questions briefly interrupted by Wannberg greeting neighbors and friends during the interview. Using the difficult medium of animating with glass and paper puppets Bernard was able to capture the emotion & vision of Wannberg’s No Mercy by a simple yet evocative animated character who bears the heavy burden of living and the daily struggles of modern day man. After viewing this film it is obvious Trevor Bernard’s film career is only just beginning and fans can certainly anticipate the brilliance of his next film Hold the Line. A touching tribute indeed is Meeting Mr. Mumps… one which should not be missed. 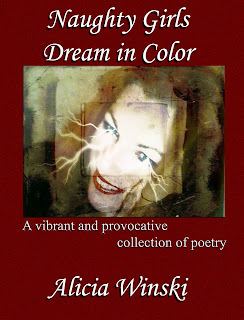 "Naughty Girls Dream in Color" is author Alicia Winski's most provacative and uninhibited collection of poetry yet. Offering poetry without boundary or censorship Winski is fearless with her love for poetry and expression.